e-systems introduce a new generation of readers for banking applications. Card Puncher for sale, bought in 2001 and seldom used. 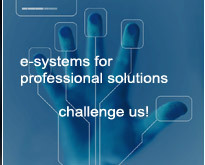 e-systems is a leading identification technology integrator and solutions provider offering standard and customized secured identification solutions for the governmental and commercial markets. The core competencies include the development and worldwide marketing of innovative ID-card solutions and advanced identification technology, complimented by authentication technologies. The company has available a wide variety of different technologies and solutions. The product range includes e-passport, national identification, and commercial access identification.